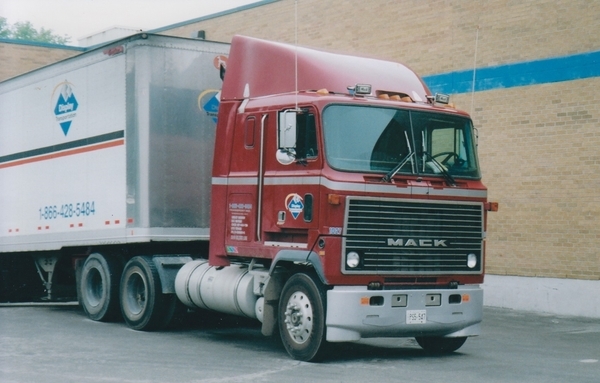 The Mack Cruiseliner was produced from 1974 -1984, in a 10 year span there were lots of them around. 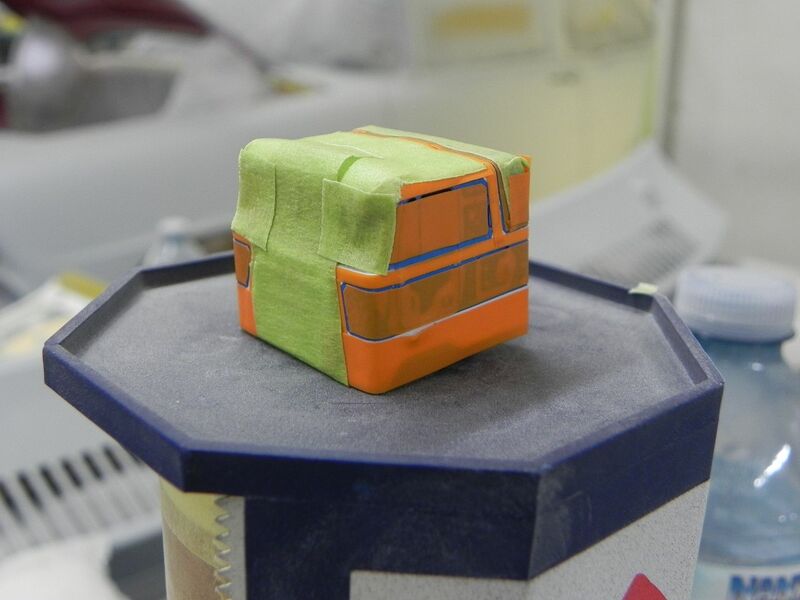 This is s build of a resin cab -seems to be a casting of the Play Art die cast toy, I had some originals around, even built them up but since I moved, can't seem to locate them. 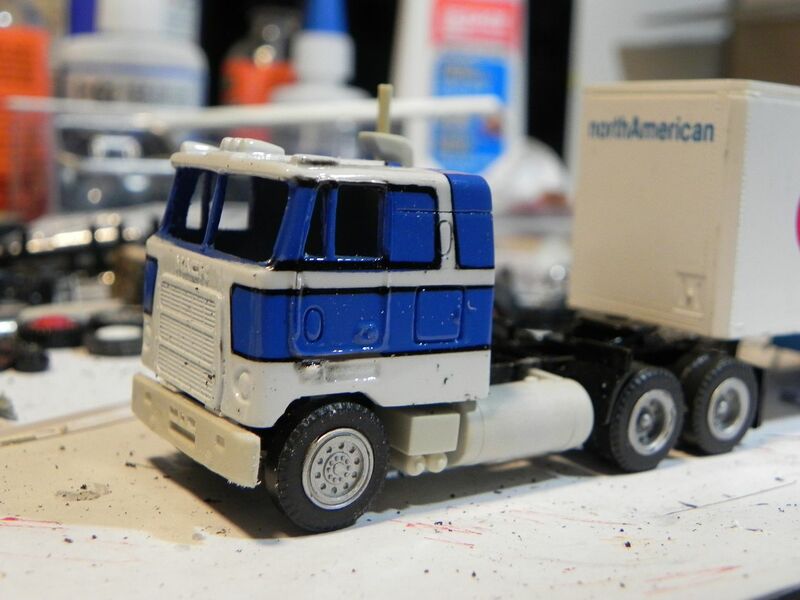 This one started sometime ago, with the blue/white applied and a clear coat, it needed a divisional stripe added, so, to begin with, here is the cab, clear slightly sanded, masked and ready to apply what ended up to be black. I thought I had taken pictures of that process but went back to my archives to 2016 and still didn't fine anything so maybe not then. 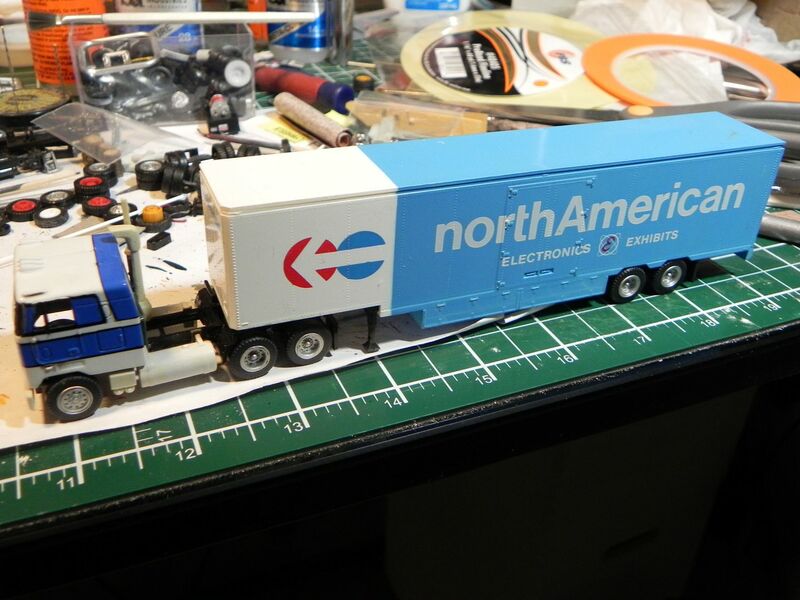 I have a North American 48' Electronics Exibit drop frame van somewhere in my stash, haven't found it back yet either, when I do, it is the trailer to be mated to this Mack. I climbed up on the Cruiseliner that was at the Mack Museum in PA about 6 months after i'd had a quadruple bypass back in 2006. Thought it was a good idea...…….then I thought they might have to call the Fire Department to get me down. It sure was high up there. I like Cruiseliner models and your paint pattern looks very good. 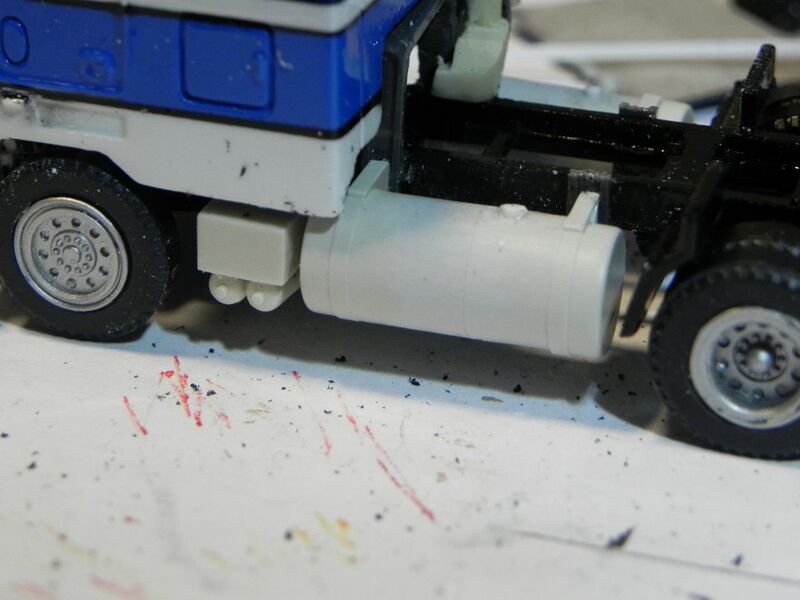 Among the truck models I built in the last years are four Cruiseliners. I was just going to go to the main webpage and see what was on there. Not planning a drom for it? I'll have to find the archives and scan something but I only recall getting one Cruiseliner and that was for Display Transport. I have a Cruise Liner from the Narwag. 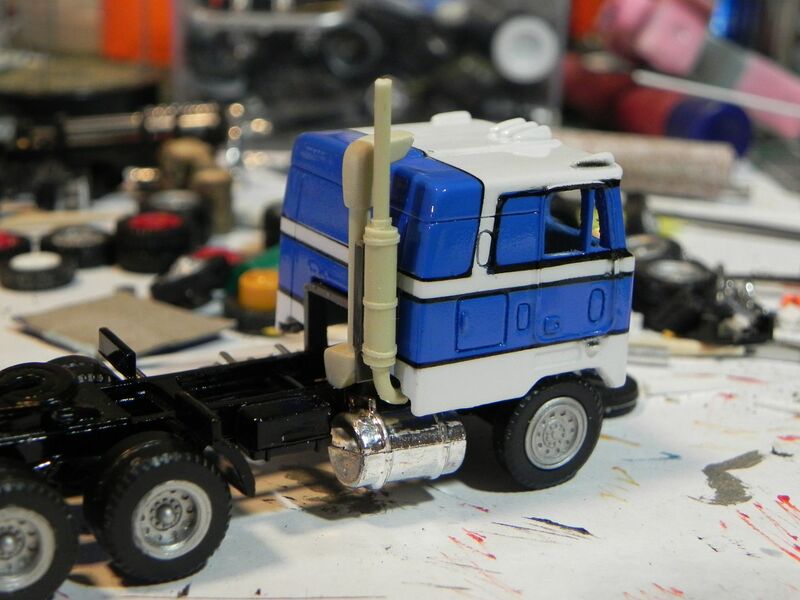 It is rather detailed with a detailed Mack engine. Can't wait to see your's completed. I was only in a Mack Cruiseliner one time . As I remember the dog house was low and seemed larger then other cabovers . I have 2 of the Playart Cruiseliners in diecast. I like the resin one also and the paint scheme you selected. Thanks everyone for all the comments so far! They do sit quite high Charlie. 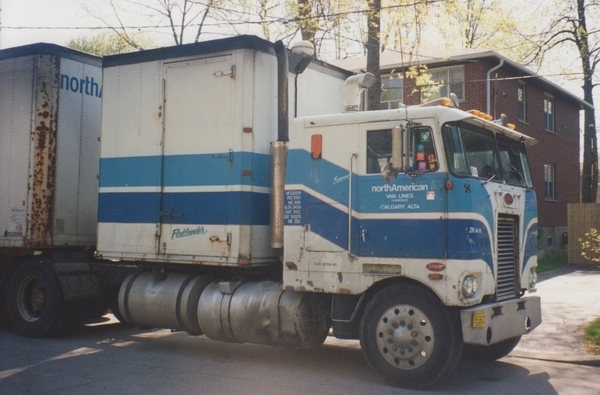 I drove a Cruiseliner on a few trips, Cummins powered though but overall a pleasant truck, not quite as warm as my Freightliner COE I usually drove. Charles, have you started your Cruisliner yet, can't say I am familiar with the Narwag one. Rob, that is a classic mover for sure, looks like he was on with Atlas Van Lines prior to this gig, either way, that colour works just as well for NAVL. That one below is actually an MH, or commonly referred to as an Ultraliner. I'm guessing a 90's vintage looking at the air dam on it! I think it debuted in 1981. 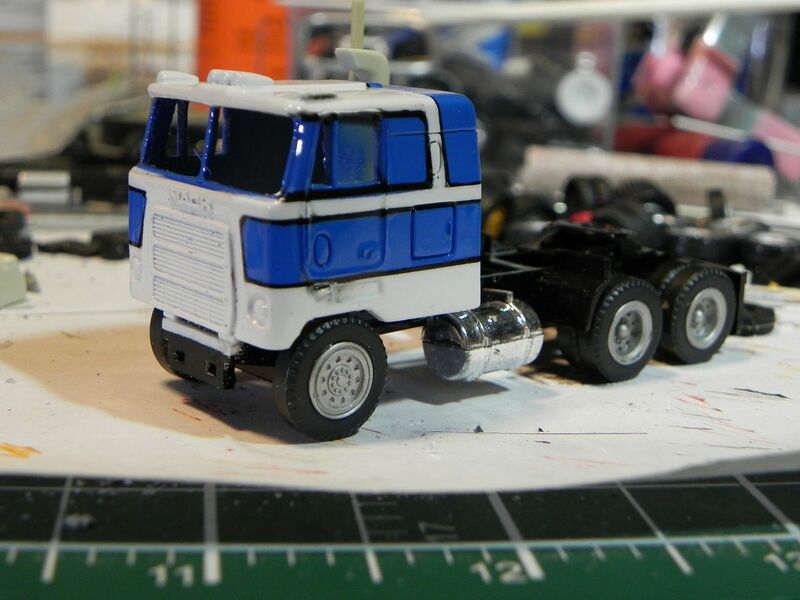 I found my trailer meantime.........looks like ConCor missed the mark on the shade of blue, IIRC NAVL was always a similar shade of blue selected for the tractor? Not sure what to do about that yet! I agree I have the Con Cor North American and it's very dark. NAVL was more of a royal blue. Oh wait. At this point I would have referenced the Bill Banks Collection on HTP for bedbuggers but that was pulled over a year ago. Nothing to check anymore with the whole HTP site on hiatus...……..gosh I miss the main site. Looks very interesting Charles, a complete kit! I will show my trailer DVE, it is the opposite, it is too light! I sure miss the main site too Charlie, I forgot about Bill Banks, what happened to him? It's a tease sometimes. 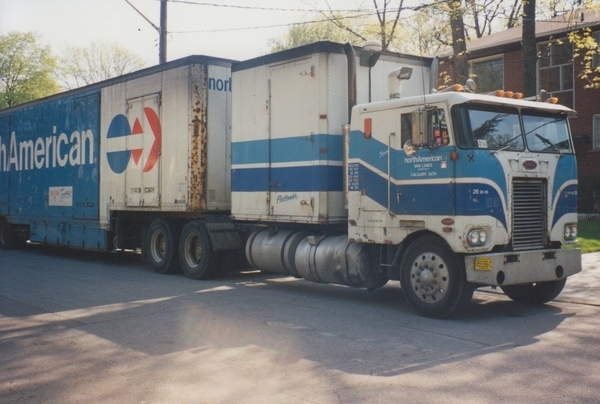 The blue on the tractor is mixed up from a NAVL fleet colour, looks closer to me then what is on this trailer.